NASA Seeks New Astronauts; Do You Have The Right Stuff? 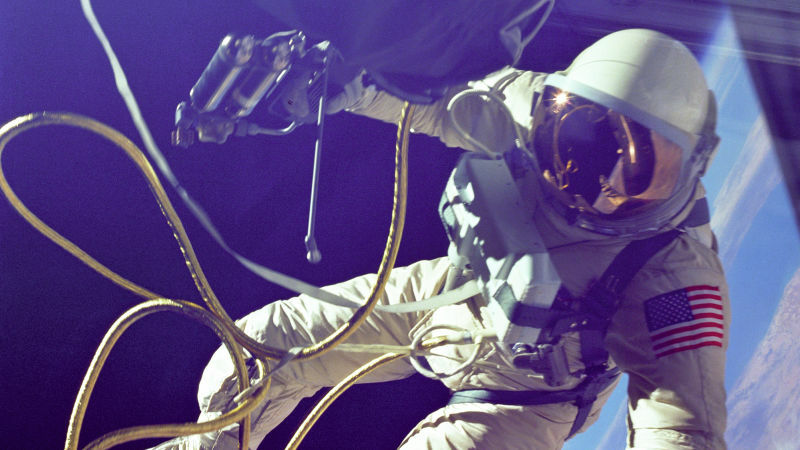 Ed White made the first spacewalk by a U.S. astronaut during the mission of Gemini 4 in June 1965. It's a bit more difficult to be picked. In 2013, more than 6,000 people applied to the program. Only eight were selected. That's an acceptance rate of a little more than one-tenth of 1 percent. But as he grew up, in Franklin Square, N.Y., that dream started to seem "ridiculous," Massimino says. "I didn't know anybody that was an astronaut." Maria Banks, a postdoctoral fellow at the Smithsonian Institution's National Air and Space Museum, is planning to apply to the astronaut corps this year. In college, she studied harp performance, and when she graduated she found a job playing on a cruise ship that traveled all over the world. "I would take soil samples and rock samples and hide them in my suitcase," Banks says. "I don't know why; I just had to do it. Every day I would try to find the most geologically interesting thing I could do — climb a volcano, or hike a desert, hike on glaciers." "I guess I didn't believe it was ... an attainable goal," Banks says. Though the technological side of the application has changed a bit over the years (Bolden wrote his application on a sheet of paper; Banks will visit the USAjobs website), the selection process has remained virtually identical. Current astronauts and NASA officials sift through the applications — eliminating the obviously unqualified and making piles, based on profession. Physicists are compared with other physicists. Pilots with other pilots. The cream of the crop (100 or so) will be invited to Houston for live interviews and medical screening. Then a small number will be selected to begin about two years of intense astronaut training. "If you're not tops at what you're doing now," Bolden says, "you're not going to be selected." "My attitude was just to be myself," Massimino says. "When you're trying to realize a life's dream, you want to speak from the heart." Finally, in 1996, NASA selected him. He flew on two shuttle missions and helped repair the Hubble. He became the first person to tweet from space. Today he's a professor at Columbia. This round will be Banks' third attempt.
" 'Just keep trying,' " she says. "Those are the words I kept hearing from all of the astronauts I talked with." If Banks is accepted, there is some question about what she'll do. The shuttle program that began with Bolden ended with Massimino in 2011. Since then, NASA has been accused of lacking clear goals. But Bolden says future astronauts have a lot to look forward to. He says they'll fly in new spacecraft and return to lunar orbit for the first time since 1972. She's preparing her application. The deadline: Feb. 18, 2016.